Designed for the advanced laser user, the 99-028K is feature-packed to tackle any job. It self-levels both horizontally and vertically, making vertical layout such as fencing, footings, and drywall track effortless. Its dual-slope mode takes the math out of the equation when checking grade or setting drainage. It also features a hard-shell contractor's carrying case to hold all system components. 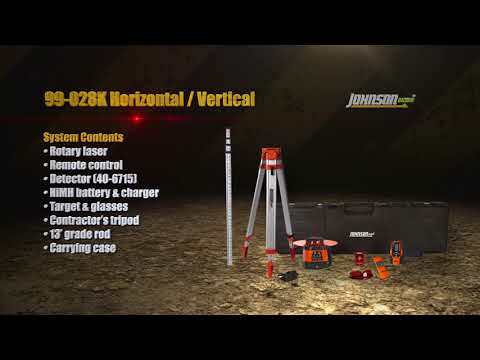 Perfect for flatwork contractors, excavators, and anyone doing vertical or slope work, the 99-028K is the workhorse of the Johnson line. Dual slope makes this laser ideal for drainage, flatwork, or complex landscaping jobs. The vertical self-leveling makes it equally suitable to aligning posts or footings, or indoors to layout walls or floors. One of our most advanced rotaries, this model is suitable for use in any rotary application!